In the fall of 1995, José Luis Castro was walking despondently on the sidewalk in front of St. Mary Church in downtown Indianapolis. “I was a little sad and depressed because I couldn’t find a job,” the Mexico native recalled. “All of a sudden I heard this voice calling me. ‘How are you doing? Where are you going? I’m Father Rodas. I’m the priest of this church. Would you like to come have a little talk?’ He invited me into the rectory, and we talked for two hours. “I’ve gone to Mass every Sunday since then,” said Castro, who at the time of meeting Father Rodas had not been practicing his Catholic faith. Castro’s story of retired Father Mauro Rodas ministering to him aligns with words and phrases others used to describe the shepherd, who is celebrating his 50th anniversary as a priest this year. Such descriptions include kind, compassionate, hard working, a defender of the faith, a gentleman. He was also years ahead of other dioceses of his time in establishing Hispanic ministry in the Archdiocese of Indianapolis. He was born in 1937 in Ecuador, the second of four children. Father Rodas was educated in Quito, the country’s capital, by the Christian Brothers, an educational order founded by St. John Baptist de La Salle. “I was attracted to the way they taught us because religious education was part of every day,” said Father Rodas. But he was more attracted to the Dominicans, who ministered at a parish near the house of one of his relatives. He recalled walking home from high school one day and deciding to go into one of the churches along his route. After finishing high school, Father Rodas became a Dominican novice. A few years into his formation, he met an Ecuadorian bishop looking for men to enter his diocesan seminary. Father Rodas’ interest was piqued and, with the permission of his Dominican superior, he transferred to the diocesan seminary. It was this seminary that ultimately set Father Rodas on the path to the Archdiocese of Indianapolis. “The bishop was friends with Msgr. Victor Goosens, who was pastor of St. Mary’s [in Indianapolis] at that time. [The bishop] received a scholarship for two students to come to Saint Meinrad [Seminary and School of Theology in St. Meinrad]. He asked me if I knew English. I said, ‘Well, I think I know more than my classmates,’ ” Father Rodas recalled with a chuckle. He was ordained a priest at Saint Meinrad on May 2, 1965. Father Rodas served at St. Mary Parish in Indianapolis for a short time, then pursued graduate studies in education and psychology at Butler University in Indianapolis. Over the years through various universities, Father Rodas earned master’s degrees in education, psychology and school counseling—as well as in Spanish literature—and a doctorate in clinical psychology. From 1967 to 1975, Father Rodas taught linguistics in Spain at the University of Madrid. When he came back to Indiana, he was assigned as associate pastor of St. Mary Parish in Indianapolis. “In the neighborhood [around St. Mary’s] lived a few Hispanic families from Mexico,” he explained. “Msgr. [Goosens] said, ‘It would be good if you walk around and visit these people, see if you can do anything for them.’ That was the beginning of the idea of taking care of Hispanics. In 1978, he became the director of what was then called the Hispanic-American apostolate in the archdiocese. He was incardinated into the archdiocese in 1979, and became pastor of St. Mary Parish in 1981. He later served the Hispanics of southern Indiana while serving as pastor of St. Joseph Parish in Corydon, St. Peter Parish in Harrison County, and Most Precious Blood Parish in New Middleton. 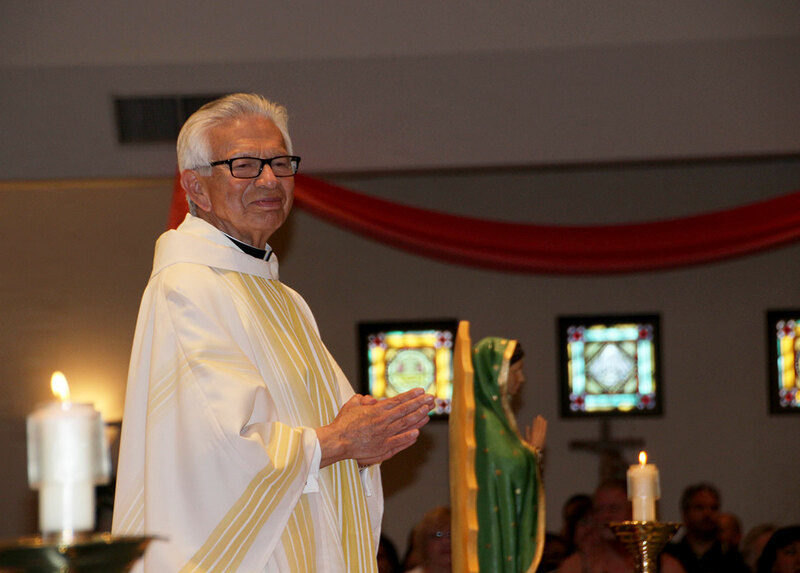 Since retiring, Father Rodas has either helped start or maintain Hispanic ministry at Our Lady of the Greenwood Parish in Greenwood, St. Mary Parish in New Albany, and Holy Spirit, St. Gabriel the Archangel and St. Lawrence parishes, all in Indianapolis. The feeling is mutual, said Castro, a member of Our Lady of the Greenwood Parish where Father Rodas currently assists with Hispanic ministry. “He became my friend, my priest, and I adopted him as a father,” he said. “He’s a really good man with a lot of strong integrity and courage. He’s a really caring person, like a father. Beyond being appreciated by the Hispanic community, Father Rodas’ ministry is appreciated by Msgr. Mark Svarczkopf, pastor of Our Lady of the Greenwood Parish. “If it weren’t for [Father Rodas], we wouldn’t have been able to begin our Hispanic ministry,” he said. “He was doing it before I came, and I’ve been here for 12 years. “We have a large number of Spanish-speaking people who wouldn’t have Spanish Mass [at Our Lady of the Greenwood] if not for him. Assisting at the Greenwood parish is just one of the ways Father Rodas stays busy. He also works 12-16 hours a week as a chaplain at Community East Hospital in Indianapolis, as well as celebrating Mass and other sacraments at St. Lawrence Parish in Indianapolis. He also assists the Filipino Catholic community in the archdiocese. With all that he does, it’s hard to consider him retired, said Benedictine Sister Joan Hunt, who has been involved in Hispanic ministry in the archdiocese for many years and helped Father Rodas start Hispanic ministry at Holy Spirit Parish in Indianapolis about 15-20 years ago. “He’s very kind, compassionate, thoughtful, and very hard working,” said the former director of religious education at the east side parish. “Father Rodas was the Spanish ministry in Indianapolis for an era,” she said. 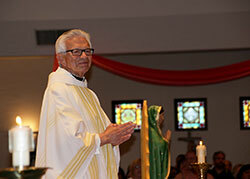 “At Holy Spirit … we invited Father Rodas to preside at a Mass at 1:30 p.m. on Sunday. I think the first Mass had four people, then the next Sunday 40, then the next Sunday 400. Within a short time, we started doing baptisms, then first Communions, first confessions, then confirmation. Whether it’s encouraging integration, celebrating sacraments or asking a downhearted man on the street to “come have a little talk,” Father Rodas has found a lifetime of reward in serving others. “That has been my satisfaction, to help others,” he said of his half-century of ministry as a priest. “I feel peaceful, satisfied and full in my heart because I realize that my life so far has been for the benefit of others.